Please know that you are genuinely welcome to phone the pottery workshop direct. Where I will be very happy to take the time to answer any questions about my work that you might like to ask. 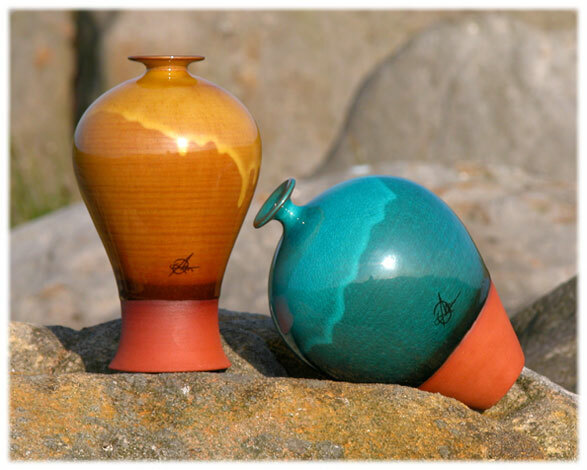 As a rough guide to 2007 prices, the smaller vessels (Height:13 -18cm) start from around £45 - £75, and gradually climb up to about £250 - £350 for a very large piece (Height: 35-45cm). When you email, or phone, please let me know, which kind of piece(s) and glaze colours you are interested in. I try to keep a varied selection of pottery available for sale at the studio, and will do my very best to help you find the piece you are looking for. As I regularly sell to collectors from all around the world I gladly welcome enquiries from overseas customers and galleries. Thank you once again for your interest in my work and I hope that you will soon enjoy owning a piece of my studio pottery. I can accept payments by sterling cheque or online via Paypal. Paypal is very popular with my overseas customers as it accepts currencies from all around the world, at no charge to the customer, and offers free payment protection. Orders under £100 are £3.95 Postage & Packing (signed for). Above £100 orders are £5.95 Postage & Packing (signed for). All orders under £100 are £7.95 Shipping & Packing (signed for). Above £100 all orders are £12.95 Shipping & Packing (signed for).